All of us, regardless of personality type, can get embarrassed by especially ridiculous moments in our lives. I don’t think an INFJ or an ESTP feel cool and confident when they rip their pants in public or fall flat on their face in front of someone they admire (well….ESTPs rarely fall flat on their faces). I think we can all admit that there are things that universally embarrass everyone. But what is unique to each type? What are some things that embarrass them that might not be universal? Let’s find out! ISTJs feel awkward when they have to improvise in new and unexpected situations. If they are suddenly called on to give a speech, react to new data, or “brainstorm” a solution to a problem it can make them feel put on the spot and uncomfortable. ISTJs prefer to work with what they know through experience, what is tried-and-true, and what they know to be dependable. Having to improvise spontaneously can make them feel out of their element. They also can feel embarrassed if they are called upon to express themselves emotionally in a public way. Responding to a surprise gift or a surprise party can make them feel awkward because they know people are expecting an emotional, excited reaction and they may not know how to muster that up for the occasion. Curious what you should NEVER say to an ISTJ? Find out here. ISFJs get embarrassed when they are presented with new information that they aren’t prepared for and have to react spontaneously. Being forced to “wing it” around other people makes them uncomfortable because they always like to have a plan of action. Things like unexpectedly having to introduce themselves in a room full of strangers or having to answer an unexpected question can all put them on edge. They can also feel embarrassed when they are expressing their feelings and someone cuts them off or interrupts them. They tend to worry that they’ve said too much or that they were boring the person who interrupted them. As a result, they may analyze what they were saying afterwards and find little details they wish they hadn’t said. Find out more about ISFJs here. ESTJs get embarrassed when they become emotional in public. They prefer to keep their emotions under wraps and they feel awkward when they cry or lose their temper around others. They usually want to show a cool, calm, and collected face to the world and they’re likely to hide their emotions unless they pertain to something vitally important. They can also feel embarrassed when they make a quick decision without spending enough time analyzing or considering the details. If the decision was a poor one and they have to publicly correct themselves they tend to feel awkward and uncomfortable. Find out more about ESTJs here. ESFJs get really uncomfortable when they are called on to be “brutally honest” with people. While most ESFJs value honesty, they have a hard time giving criticism that may hurt someone’s feelings or negatively impact them. As an example, many ESFJs report being embarrassed and stressed in work situations where they have to critique someone else’s performance to their face or while the individual is present. ESFJs also get embarrassed when they “lose their cool” and become especially critical. ESFJs experiencing chronic stress can become more critical than usual, but once they return to a normal healthy stage they can feel ashamed or embarrassed about what they said. ESFJs also tend to get embarrassed if people show up to their house unexpectedly and things are messy or they aren’t at their best. Find out more about ESFJs here. ISTPs get embarrassed when they react emotionally to situations or people. They tend to feel uncomfortable expressing themselves emotionally, and they prefer it if they can appear cool and calm. Crying is especially awkward for them, and most ISTPs will do whatever they can to avoid crying in front of other people. When they are faced with their own emotions, or even the emotions of other people, they can feel awkward and uncomfortable. They may even find themselves getting embarrassed when the people they care about are embarrassed. Find out more about ISTPs here. ISFPs get embarrassed when they receive public criticism or correction. Even if the criticism is constructive and not meant to do harm they tend to take it hard and feel awkward as a result. They also tend to feel uncomfortable when they show the world something personal to them; a piece of art, a song they love, or a story they wrote only to get critical feedback. Having their favorite things analyzed and picked apart tends to feel very personal to them and it can make them feel awkward to share that part of themselves. Find out more about ISFPs here. ESTPs are not typically easy to embarrass, but there are a few things that make them squirm. One thing that is particularly embarrassing to them is when they have an emotional outburst, particularly crying. Because they tend to suppress their emotions in favor of appearing cool and composed, their emotions can sometimes catch them by surprise. This nearly always makes them feel awkward. Another thing that can embarrass them is when they mean to do something nice for someone and it’s taken the wrong way. For example, they buy someone a humorous gift and instead of the person laughing, they are offended by it. Find out more about ESTPs here. ESFPs find themselves embarrassed when they make a joke that falls flat or they plan an exciting experience for people and the participants seem bored or disinterested. They also tend to get embarrassed when people mock their energy and enthusiasm and make condescending or patronizing comments to them. Certain types of people misread the ESFP’s lively nature and sense of humor and mistake it for “shallowness”. This is unfortunate because there is actually a lot more to ESFPs than meets the eye and while they enjoy showing people a good time publicly, they are also deeply caring, emotionally intelligent, and resourceful. Find out more about ESFPs here. INTJs tend to feel embarrassed when they have to react spontaneously to physical changes or demands and aren’t sure how to respond. Because sensing is their least-preferred mental process they can feel awkward when they have to suddenly improvise a speech, direct people in an unfamiliar environment, dance if they don’t know how, etc,. They also tend to get embarrassed when people gush over them publicly and draw a lot of attention to them. They especially hate having to conform to social norms for a long period of time. Some INTJs report getting embarrassed when they have to engage in small talk and other socially expected rituals and accidentally say the wrong things or can’t think of anything to say at all. Find out more about INTJs here. INFJs feel embarrassed when they are put on the spot and have to react to their environment spontaneously. This could involve things like being asked to dance in a club when they don’t know how to dance, being asked to improvise a speech, or having to drive with a guest in an unfamiliar environment. Because sensing is their least-favored function they tend to have difficulty navigating smoothly in the physical world (unless they’ve made a conscious effort to work on this). INFJs also feel embarrassed when they cry in front of others or react emotionally to criticism. They also experience “second-hand embarrassment”. This occurs when they empathize too strongly with someone who has done something awkward or is embarrassing themselves. Find out more about INFJs here. ENTJs are typically difficult to embarrass, but one thing that really makes them feel awkward is demonstrations of emotion. If they find themselves getting emotional, especially crying, they tend to feel extremely uncomfortable. They want to show the world a calm, determined face and tend to see their own emotional demonstrations as a weakness. They can also get embarrassed when someone they care about is having an emotional breakdown. They don’t usually know how to handle these situations well or how to console someone. They may try to awkwardly comfort them, but they inevitably wind up feeling unsure of themselves. Find out more about ENTJs here. ENFJs get very embarrassed when they make a social faux pas. These types are extremely aware of what’s tactful, expected, and proper. They care a lot about the impressions they make and how comfortable everyone is feeling. When they inadvertently say the wrong thing it can make them feel horribly ashamed. For example, if someone told them a secret but they didn’t know it was a secret so they mentioned it later in a group only to be met with awkward discomfort. ENFJs also tend feel embarrassed when they have to give or receive criticism. They hate letting people down and they especially hate pointing out other people’s mistakes (unless they’re very angry). They tend to imagine how the other person would feel who is receiving the criticism and get embarrassed for them. Find out more about ENFJs here. INTPs get embarrassed when they receive compliments or when they get publicly emotional. They tend to be guarded about their feelings, but during times of high-stress they can become uncharacteristically emotional. This makes them feel awkward or bad about themselves because they tend to look down on their emotions and see them as a weakness. They also get embarrassed when they have to comfort someone who is having an emotional outburst. They tend to be unsure of what to say or do and, even though they really want to help. As INTPs get older they usually develop more comfort with their emotions and start to recognize their positive qualities. Find out more about INTPs here. INFPs get embarrassed when they are put on the spot and are expected to react emotionally to something. This could involve something like being given a really exorbitant gift or having a surprise party thrown for them. The pressure of having everyone looking at them waiting for a reaction can make them feel shy or awkward. Many INFPs also experience “second-hand embarrassment”. For example, they might feel embarrassed when someone is trying to make jokes but they are all falling flat. They tend to empathize so well that they can feel the shame and awkwardness other people are feeling, even if they don’t want to. INFPs also tend to feel embarrassed when they are given criticism over work that is personal to them. For example, if they wrote a short story and it was analyzed in a classroom setting. Their work is all very personal to them, so it feels like they are putting a very private part of themselves on display for other people to scrutinize. ENTPs are usually more difficult to embarrass than other types. They tend to improvise and react to awkward situations quickly and turn it around in their favor. However, they do tend to get embarrassed when they make awkward physical blunders. For example, trying to look in a window and accidentally banging their head on the glass. They also can get embarrassed when they look over an important detail in their work and are publicly corrected for it later. Because they are more focused on theories, big-picture ideas, and concepts, they can lose sight of nitty-gritty details and regret it later. ENFPs tend to get embarrassed when they are speaking passionately about something only to realize they have some of their details wrong. ENFPs are big picture, conceptually-focused people who see things in impressions and can lose sight of the small details. When little flaws or loopholes in their speech are pointed out they can feel awkward about it. They can also feel embarrassed after a social event where they were especially talkative. Many ENFPs have the habit of re-analyzing what they said later and during this time they might find awkward moments in the conversation or regret saying more than they meant to. Find out more about ENFPs here. 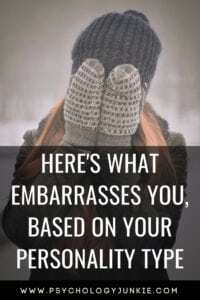 Do these things embarrass you? What are your thoughts? Let us know in the comments! I have actually banged my head on a couple of windows while trying to look through. One of them was convex and I didn’t realise it until *thud*. Also, I really really really can NOT dance either, but I fake it by relaxing and just spasming like a boss. (I mean, have you seen the single ladies dance? That was choreographed by professionals, and it’s cheesy, so why should my just-getting-by moves be any less respected?? ^U^ ) What is my point again… oh yes, “how to stifle your dancing embarrassment”. My biggest embarrasment is when I’m being challenged verbally and my brain goes slow and I’m unable to respond quickly enough. Ugh! Hmm, it almost seems like all of these examples could be applied to just about anyone! It does seem so, doesn’t it? Although maybe some types might be more *deeply* embarrassed by things that other types are more superficially embarrassed by? I guess it depends. Some of the things might be more universal (I know a lot more people that are embarrassed by crying than aren’t), but some things are more unique. For example, my ESTP husband wouldn’t mind at all driving with someone in an unfamiliar environment or my ENFJ sister wouldn’t feel embarrassed about crying around someone else (depending on the reason of course). So some things are more unique to type than others, and some are especially more embarrassing to some types than others. I HATE crying around people (I’m an INFJ), but it’s not nearly as awful for me as it would be for my ENTJ dad. Hope that helps! I type as ENFP and I feel like melting into the floor when I think I might be talking too much. I try to pause, but then it becomes awkward beause there’s this deafening silence, especially if the other person isn’t talkative. I only feel a little more relaxed in such a situation when it’s a close friend. Sometimes I think I’m just really excited and too eager to bond emotionally, so I tend to overshare and ramble as if overcompensating for the other person’s lack of sharing. I think it’s also embarrassing because usually I’m so used to evaluating a social or emotional situation but sometimes I can’t tell if the person prefers me to speak or if they’d like time to process before responding. I try to fill in the gaps. Ughhhh.